At the end of a long busy day, my family wants dinner. I am usually too tired to think about what to make so I usually make something like pasta or peanut butter and jelly for the boys. I then tell my husband that it is fend for yourself night and he makes a sandwich. When I do cook, I usually make the same things that I know my husband will like. So dinner has been quite boring at our house lately. So I decided to give Green Chef a chance to get some new healthy meals on the table that my family would enjoy. Keep reading and find out how you can save $50 off your first order and get 6 meals for under $20.00. 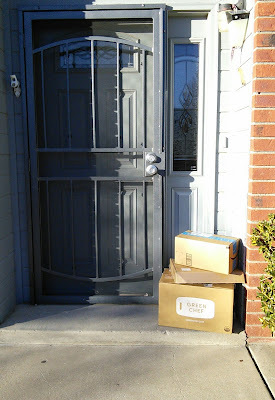 I just love that I can get a box of organic healthy food delivered to my house! 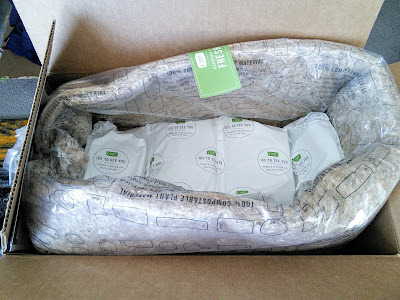 When my box of food arrived, I was excited to open it to see what meals I would be able to make for dinner this week. I choose the 3-meal vegetarian box as I am always looking for new ways to make meatless meals for my family. I just love that Green Chef uses Eco-friendly Insulated, refrigerated boxes to keep the food cold, that way I don't have to wait around for the delivery man. It is pretty cool that they use compostable materials to keep the food cold along with reusable ice packs. The insulating material went into my compost pile and the ice packs went into my husbands camping supplies. I loved how everything was color coded for the 3 recipes that I was going to make. The veggies were all very fresh. I received my food box on Tuesday and only made one of the recipes. The other two were not made until Saturday and the veggies were still fresh. All the ingredients were also premeasured for each recipe. 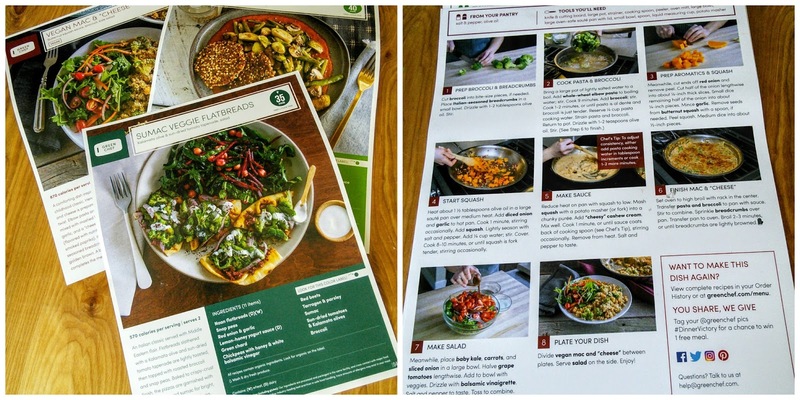 Each recipe came with a colorful card that not only showed what the finished recipe would look like but had step by step instructions with pictures. That made it real easy to prepare the ingredients. I even learned some new techniques that made me feel like I was taking a cooking class. 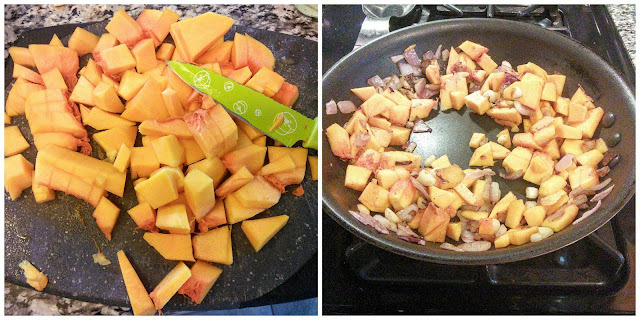 I learned how to peel and cook butternut squash for the Vegan mac and cheese that tasted amazing. In fact, my family did not even miss the cheese in this dish and the dish was so creamy! The one thing I liked best about Green Chef was that each meal came with a vegetable side like a salad or roasted veggies. It made me happy to see my husband enjoying vegetables and it gave me new ways to make vegetables enticing to my family. Next time I go to buy produce, I will be buying some new vegetables for our meals. 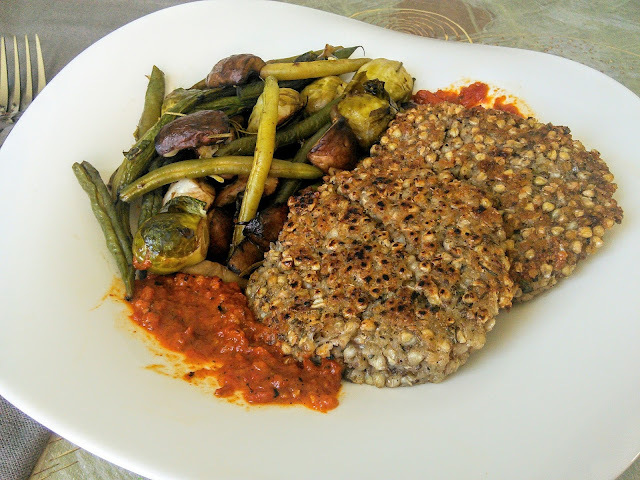 I also learned a new way to serve buckwheat as the recipe for Buckwheat-chia fritters was very delicious. The crispy cheesy fritters were served with this yummy roasted pepper sauce and oven roasted balsamic vegetables. This was my favorite meal. I must learn how to make these patties and sauce as I am craving this dish. My husband's favorite dish was the Sumac Veggie Flatbreads. 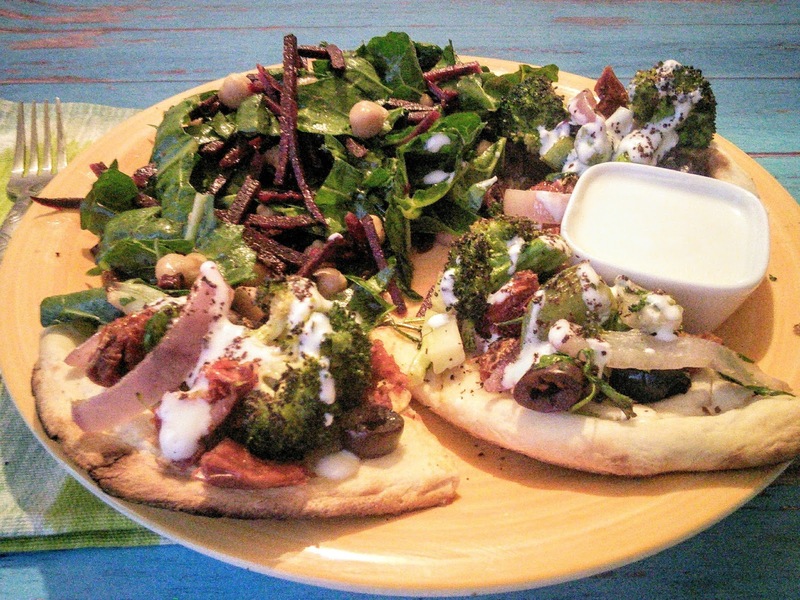 The flatbreads were mini pizzas loaded with roasted broccoli, sun-dried tomatoes, and kalamata olives. The lemon yogurt sauce and sumac spice gave the flatbread pizzas awesome taste. This was the first time I had tried sumac and it is a nice sweet spice. My husband really enjoyed the green chard salad that accompanied the meal. Since this salad had beets in it, his favorite vegetable, he finally gave green chard a try. I really enjoyed making dinner with the Green Chef meal box and it did not seem like a chore to get dinner on the table. Even though each recipe served 2, the servings were generous so it was enough for 2 adults and 2 kids. Green Chef has a wide variety of plans to choose from to please meat eaters, paleo, vegan, and even gluten-free. I love that you can choose seafood items with some of the plans. I had a tough time deciding which box to order. I think my next box will be the Omnivore box as this plan includes seafood, meat, and vegetarian. My husband will enjoy having meat on the table once in a while. I love that I can choose when my meal box will be delivered and I can even skip weeks. Green Chef will be on my table more often as it not only feeds my family healthy food but it helps me to learn how to make new tasty dishes that my family enjoys. 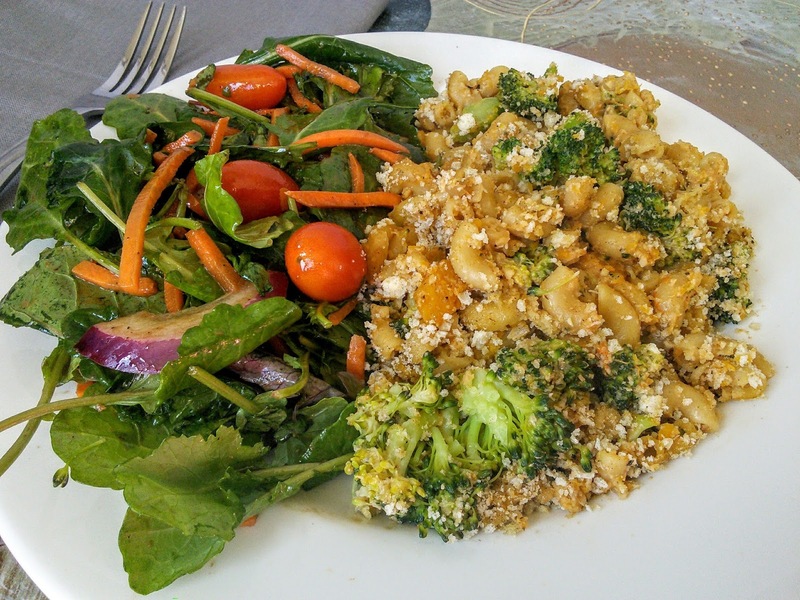 So are you ready to add some new delicious healthy meals to your dinner table? 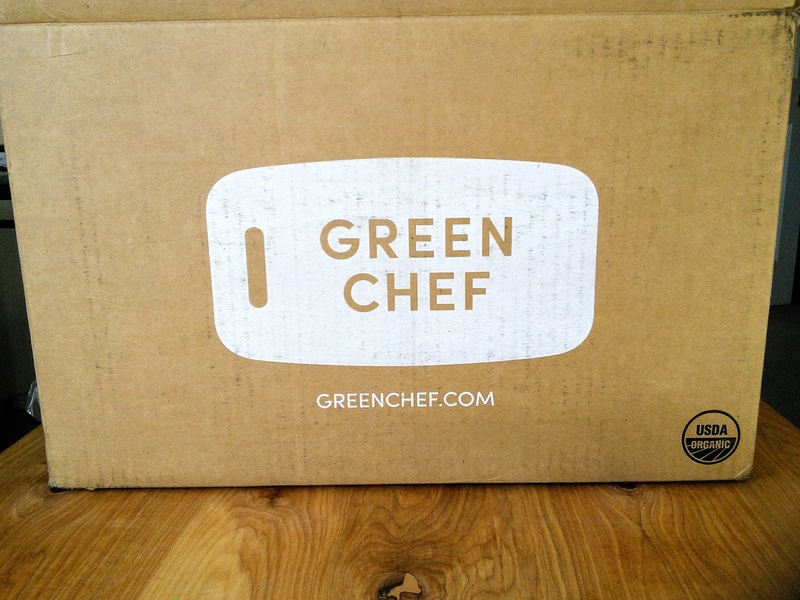 You can even save $50.00 off your first box of Green Chef. Click on the below link to find out more about this delicious meal box. With the $50 savings, your first box will be a great price. There is no commitment either if you don't like your first box you can cancel but I think you will love the food. Just remember to click on the below link to get the $50 savings. I think I have heard of something similar here in the UK, I am lime you when it comes to cooking! I love the sound of the recipes you tried and love the fact that it has a picture guide as well as written method. All of that food looks so good. Will have to check out the Green Chef for my family. Thank you for sharing this! I actually went to an audition for this company! ha! Sadly, I did not book it, but that doesn't mean, I wouldn't try it! This guilt free foods that use to nourish our body yet so tasty was all I ever wanted. Having any kind of fresh veggies on my table is a must. I'll better check them out. I really need a service like this! I have been working so late lately that dinner time just passes by and I have no idea what I'm even going to make much less have dinner ready. Then of course it's something quick and not healthy. This would work well for busy moms and career women who barely have enough time to shop and cook meals for the family. I always want to make sure my family not only gets fed, but nourished as well. I will have to check out this Green Chef service. Looks like they will have me as a new customer. Wow, this is nice, i love the idea that there are pictures on the guide as it will make more easier to follow and see the result. Good thing it's a healthy too! Oo this looks so tasty! I think I'd like it. My kids might be freaked out, but oh well. How fantastic - we all have days when we're too tired to cooked or there's too much going on. This is a healthy way to make sure everyone gets a decent meal and I love that it's organic. good meal for the day. we need balance meal not always fast food or unhealthy food. You are great mom. Thanks for sharing your healthy meal. I am inspired to slowly so it. That looks so amazing, I adore how it comes with everything and the great instructions. I would need those!! Such a lovely healthy meal. I'd try prepare this for my family too! I really appreciate boxes like this! It's awesome that you are able to get dinner done without having to go out and get the ingredients yourself. I think it eliminates the stress of thinking about what to cook for dinner every night. I have seen a lot of ads for this and wanted to try it out! I think you have made up my mind. All of this looks yummy! I buy a lot of my food stuff from subscription boxes. 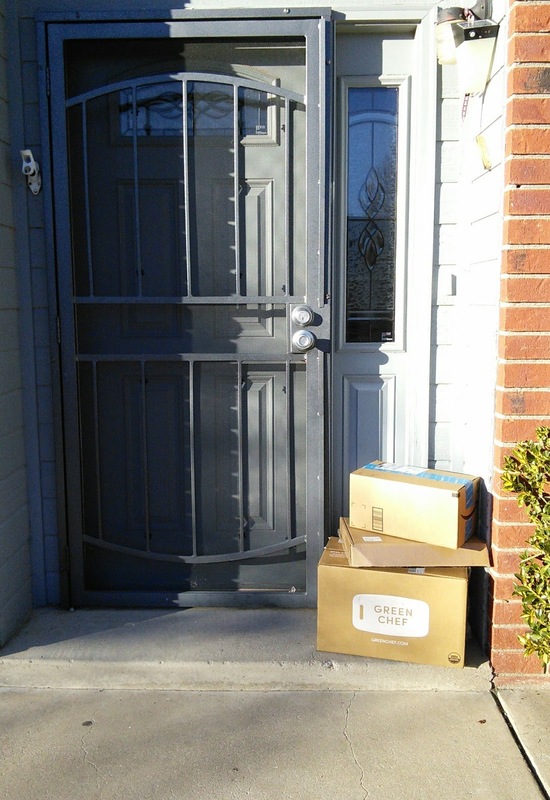 I'm disabled so it helps to have it delivered. I'll have to see if this company is right for me as well.